The Thunder stole Game 1 and homecourt advantage. But have they really? It will only take the Warriors one road win to take it back, and that is not so far-fetch to think of. We'll see. For Game 2, I have changed my pick to Iguodala. The Dubs' Death Lineup heavily involes Iggy as he logged 32 minutes in Game 1. Hopefully, his minutes translate to some stat sheet stuffing. I still believe that the Warriors can win this series, and that is why I have moved Westbrook's elimination game to Game 5. As for the East, it looks like the Cavs have control of that series and Valanciunas does not look like he'll go Willis Reed anytime soon. Nothing's changed much with the pick plan, except putting soon-to-be free agent James Johnson for Game 4. And oh! Can Philly please start grooming and winning with their trio of Okafor-Embiid-Ingram/Simmons? Really, tanking never is fun. UPDATE: With Delladova's injury, I'm switching my pick to Cory Joseph in Game 3. Will he fare better versus Mo Williams? Or will they just play Kyle Lowry more? one of my picks has been deleted and I'm 100% sure I made the pick. Matter of fact, it was still being displayed yesterday. It was my pick for GSW-OKC Game 1 (Harrison Barnes). Any chance you could look into it? Did this happen to anybody else as well or was it just me? I'm also picking Iggy today. I still think the Warriors are just too good to be eliminated (same as I thought with the Spurs, DANGER!). Anyway, even if they lose it will not be in 4 games, so there's time to panic later. I'm picking Harrison Barnes in DTTF. I'm taping the survivor finale to watch when I get home from work, so I won't be watching the game. So I'd rather save Draymond and Klaymond for a game I plan on watching. Barnes it is! I watch survivor too, I was really surprised about the first jury elimination in history! This was a really cool season! As for these games, maybe I can pop champagne as I finally picked someone who got the Big 2O! That honor went to Harrison Barnes (for the google pick). Meanwhile D&S continues to be a disaster with my 5th straight pick and 7 of the last 8 that got under 20 actual PARBS before being multiplied. Shaun Livingston was on fire with 9 PAR oh I forgot to factor in his blocks (0) and steals (0) so he actually has... oh still has 9, but wait we'll triple that LOL! So he looks better with 27. This pick in fact falls in the bottom 3 along with Zach Randolph 14 X1 and Kent Bazemore 10 X2 (20), and in reality is the worst pick of the season on both games! He gave me 8 the other night on google. This is the price we pay for guessing wrong ("Hey Spurs!" There is a note: "We are out fishing so come back in several months.") not to mention getting awful results (from my Thunder picks) to boot! Yeah, the jury elimination was cool. Great season! I was actually more surprised that one of the greatest social and strategic players of all time made it all the way to the end of the game... and didn't win? That was truly shocking. Almost as shocking as Harrison Barnes finishing only -13 on Curry, -5 on Draymond, and -1 on Klay. Weird evening. Thompson yesterday was underwhelming. Ah well, can´t win ´em all. Now for a history lesson, for my fellow Mavs fans. Back in 2006 the Mavs were a few minutes away from a 3-0 lead in the Finals, but then crumbled, thanks to D-Wade and the refs. They came back with a vengeance in 2007 and beat up the league pretty good, after a 0-4 start they made it to 67 wins. There has never been a team with at least 67 wins that didn´t win the title afterwards. The Mavs? Squandered homecourt in g1 of the first round the Warriors and barely made it to g6 where they got thrashed in Dub-City. That was not a good time. Dirk won his ring in 2011, so I am content with that. But there was still this nagging need for petty revenge inside of me. Now last year, the Warriors were the team to beat, but the hobbled Cavs managed to go up 2-1 in the Finals and had game 4 at home. My dream? The Cavs win it all, the Warriors come back next season better than ever, and then the Mavs oust them in round 1, sweet revenge for 2006. The Warriors on the other hand even without Curry for long stretches raced to the conference finals with ease, their biggest opponent stopped by another team. But now? It looks a little bit like the Thunder might have a real chance at a bigger upset than anyone imagined. First they took out the Spurs. Can they do the same to the Warriors? If the Dubs really lose the series, and as yet I can´t imagine this happening, it wouldn´t be nearly as bad as what happend to the Mavs nine years ago. But, I hate to admit, it would probably make me smile a little bit. Yes, I am petty. I am allowed to be. Having said that, I still think the Warriors are too good to go out (thought the same back in 2007 about the Mavs), so as of now I still think of a rematch in the Finals. I will pick a Warrior at home anyway, like I planned to all along. I will roll the dice with Harrison Barnes. Should the Thunder continue to perform like the Mavs in 2011 and close out tight games really good, then it will be panic mode two days from now. Tomorrow it will be another Cav. As of now I have J.R.Smith pencilled in but that might still change. Saving Lowry and other Raptors for home games. I feel you, but I have already forgiven the Dubs when Dirk agreed to sign the wall he hulk-smashed in the visitor's locker. It was closure for me. 2006 Wade I have forgiven. Not his fault. They prolly deserve it. 2006 Finals refs though, I remember. Raises fist. Ah, that´s okay. The Warrirors were a long suffering club, right behind the Clippers. And they have probably the greatest fans in the NBA. So I was happy for them to win it last season. Now I wish the poor tormented Cleveland fans would finally get some closure. On another note... In my picks you have 3 players down for the 15th, Bismack Biyombo, Joe Johnson and Goran Dragic. It should only be just one, Goran Dragic. I posted in the previous thread but no reply yet. Could someone edit my pick for me. I noticed that I put the wrong date down for J.R. Smith It was a bad pick but that's my fault! My username is tilly. Hey Tilly, changed date to 17. The Cleveland Cavaliers annihilated the Toronto Raptors as expected, and this looks to be a very short, short series. My pick of Patrick Patterson (14 PRA) wasn't great by any means, but looking at every other Toronto score, it wasn't exactly dreadful either. DeMar DeRozan (23 PRA and Raptors leader of the game) and Kyle Lowry (17 PRA) were both horribly poor vs. their averages. So at least I didn't pick one of them from the losing team. For tonight this is a now a must win game for Golden State playing at home, after collapsing in the 4th quarter and punting away Game #1 at home. A loss here tonight could be the beginning of the end for them, so you have to figure they at least win Game #2 at home. Otherwise OKC could coast to the Finals. I pretty much did major damage to the OKC roster, and with them winning Game #1 on the road, I have more Warriors options to pick from now, and have no urgency to pick a OKC Thunder player at this point. So with that in mind I will pick Harrison Barnes of the Golden State Warriors hoping he can put up 25+ PRA tonight, which he definitely has done so before when facing the Thunder. Harrison Barnes also did have 19 PRA in Game #1, so he is definitely capable of doing slightly better than that in a must win game for the Warriors tonight. In retrospect, Barnes was a great pick. 20 PRA was more than I expected, and nobody really stood out in a blowout. Best pick might have been Festus Ezeli, as I don´t think he will go double digits in scoring again. Tonight I will keep J.R. Smith. Let´s hope he cracks 15 or more. Then, after a day of no picks, I will probably start with the big guys. I agree, Festus Ezeli had a big game for him in last night's crushing defeat of OKC by the Warriors. I was kind of waiting for Andrew Bogut to be scratched to try that move as supposedly Bogut is playing hurt, but they keep staring him, and that keeps me away from picking Festus Ezeli (or Marreese Speights for that matter). But with the blow out, both players did about as well as several starters. First of all thanks for the oportunity you give us to play this game. To be honest it doesnt really matter because in my league i am way ahead of my friends. I mention this so you can check if there is a problem with your code or smth wrong with other "members" too. hey mac, i'll check yours in a few minutes. i'll check your mates after work. mac, i'm guessing you live in the East part of the globe and are a day ahead of New York, and tried to self-convert time when you already had NY time displayed. you had derozan 13, biyombo 15, kanter 16, green 18, johnson 19.
then msg here later which of em i should correct. thanks! Yes i live in Greece gmt +3(summer time), now here it's 03:25 am. I didnt change smth in time in my pc or my account, maybe its because i made the picks really late, minutes or 1 hour before the games started. I checked my mates accounts at 'pics' and 'pickz' pages and they have the same picks. So i guess they are ok! Some of them clearly have stoped the game. I asked the rest of them if they have something wrong with their picks and i let you know tommorow because here it's really late in the night. Thanks for the effort again! Nobody answered so i guess they have no problem or they stopped the game. Golden State righted their ship with a convincing 27 point mega blow out that was never close. The upcoming 2 games in OKC will most likely determine the winner of this series. If the Warriors win one at OKC (or more), they will be well on their way to making it to the finals. If OKC wins both games, this series would still favor OKC moving on. It is all up to OKC on home court now to see how this series plays out. My Harrison Barnes pick (20 PRA) was decent but slightly failed to meet goal of 25+ PRA. This game getting out of hand early didn't help things for him or any of the other GSW starters at all, with all of them finding the bench early in the second half because of the slaughter. It also made Festus Ezeli (18 PRA) and Marreese Speights (15 PRA) decent options with normally wildly inconsistent to downright nonexistent Andrew Bogut (11 PRA)on the bench. If Bogut actually gets scratched from any game going forward both Festus Ezeli and Marreese Speights could be possible options to consider. But other than a game ending in being out of control, he really limits both Ezeli and Speights, although both were good on this night vs. average. For tonight, no reason to think Cleveland won't annihilate Toronto again while playing at home. Jonas Valanciunas is still out, so I guess now is the time to go with Bismack Biyombo of the Raptors before Valanciunas comes back (if he even does). Biyombo had 16 PRA in Game #1 of this series. Barring a miracle Cleveland figures to move on to the next round here, sooner rather than later. So with that in mind going with Bismack Biyombo tonight hoping for 20+ PRA out of him. I was extremely pleased with a 20 from Barnes, on a night when the starters all did mediocre (PRA-wise). Actually, the game getting out of hand did help things. Harrison Barnes played almost the entire fourth quarter. He played garbage time. It was what allowed him to finish at 20. The goal of 25+ for Barnes probably was more wishful thinking. He hasn't done it all playoffs. I had JR Smith tonight in Drive & Slam. I feel like I wasn't alone with that pick haha. He was OK. I'll take a 15 since I wasn't planning on using him later anyways. In DTTF, I had 2Pat. Only 11 PRA. But almost everyone did poorly. In other words, it was a good night to be picking the Patterson's, Frye's, and Joseph's of the world. 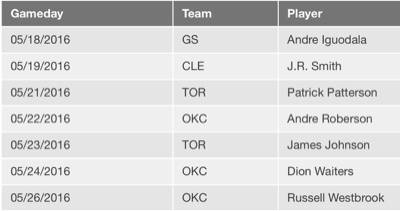 JR Smith was the hot pick on google, and him getting a 15 was huge. My 2Pat pick went against the hot pick, which can be terrifying when you are the leader. It worked out alright. Up next, Bismack Biyombo! I wanted to save him for a game when the home crowd is cheering him on. He's a high energy player who grabs boards and attacks inside. That's a good guy to have for a home game. Yeah, Biyombo does play good games at home. I still remember last one, nice 72 points xD Go Bismack! My plan from the beginning of this round was using DeRozan in game 3. Now I am not sure, since he played 2 good games in a row. I use to like picking players who played a bad game looking to bounce back. But probably most people will pick him in elimination game, so I will keep my plan by now. Ross for game 4. Good luck everyone! I picked DeRozan tonight as well in Drive & Slam (I picked Biyombo with you on Game 7, and Biyombo is my DTTF pick tonight as I picked DeRozan on Game 7 for DTTF). So far, both have been great. DeRozan dropping 21 points and Biyombo grabbing an insane 16 rebounds! Could go either way. Both guys can heat up and then disappear. Joseph gets boards and dimes, so I like him better. Looks like I'm going to get to use Hassan Whiteside afterall! I hope he can give me positive PAR, it won't be easy though since his team is eliminated. Cleveland heads to Toronto tonight on their path towards punching their ticket to the NBA Finals. These games might be closer since they are in Toronto, but Cleveland should win at least one of these games, if not both, then if necessary wrap things up at home or just rest as the West Finals are likely to go longer than the East Finals. Bismack Biyombo (8 PRA) was horrible and nonexistent in Game #2, and only put up half what he did in Game #1 (16 PRA). I thought I had to use Biyombo before Jonas Valanciunas came back, but apparently that isn't going to happen anytime soon. So there was still time to pick Biyombo, preferably at home tonight, but now any chance of that happening is finished now, and he stunk when I used him, which is even worse. Now watch him light up the scoreboard tonight or Game #4. With the crushing defeat for Toronto scores for their starters were less than stellar: DeMar DeRozan led the pack with 29 PRA, Cory Joseph (19 PRA), James Johnson (15 PRA), Terrence Ross (14 PRA), DeMarre Carroll (13 PRA). All of these were better than Bismack Biyombo, except for maybe Kyle Lowry (19 PRA) who was way below his average, and has been awful for both games of this series. For tonight, Luis Scola is getting the start, so I will roll the dice with him. If he can somehow put up 15+ PRA, that would be decent. I was also looking at DeMarre Carroll, but went with Scola because he was spot starting. Have you picked DeRozan or Lowry yet? I'd be interested in hearing why you'd pass on either of those guys because it seems like you still have both of them. Can't be afraid of losing the 4x multiplier. You should be more afraid of a sweep and losing the 3x multiplier than the slim possibility of losing the 4x multiplier. I have not picked either DeRozan or Lowry yet. DeRozan is my elimination game pick, and until Game #3, Lowry has been a sheer disaster. I would rather pick some scrub for 12 PRA than pick Lowry and get an incredibly underwhelming disaster of a 19 or less PRA out of him. Picking Kyle Lowry on a night like that would be totally infuriating, to say the least. J R Smith for me tonight..
Great pick so far Taong. Switching with Delly hurt is very smart, as he's such a defensive presence as the backup point guard. Lowry foul trouble has helped a lot too. BUT he has 20 REBOUNDS! So he has 22 after 3, I got 16 from him in game 1. Of course I thought a certain player would be returning to the lineup and he's NOT there! Has Jonas Valanciunas flown the coop? I need you, as 8 of the other 11 players have used you and I haven't! I missed a rebounds so make that 21 boards and 23 PAR after 3 for Bimbo! I got Carrol who has 15 PAR at this point, but if DeRozan beats him by more than 16 (29-13 in G2) and Bimbo beats him by more than 12 (16-4 in G1) I ended up with a horrible order. Every game this series, I was watching the injury report. Ahead of game 1, JV was announced doubtful for game 2. I waited. Ahead of game 2, JV was now doubtful for game 3. I waited. And then Dikembe Biyombo struck at home! Biyombo with an interesting stat tonight: Most rebounds in a playoff game by a non-Rocket since 1984, with 26. Or, the less-interesting way to put it, tied for most rebounds in a playoff game since 1984 with Hakeem Olajuwon (1988 - 26) and Dwight Howard (2015 - 26). Amazing the heads up stats (over a game in advance) that everyone else seems to get. Thanks Jonas Valanciunas for getting injured before I picked you and then staying injured longer than expected to trick me out of using your replacement earlier then I would have if you weren't pretending on coming back! I'm still signed up with ESPN fantasy basketball, and I go there and read the player updates they have. It's useful. Hope you are able to find the same or something similar. I plan on using Ibaka tonight..
Great job... Great write ups!!! Okay, it seems to work again. Probably the most frustrating part about this little game is when you pick the players in the wrong order and/or on the wrong day. I squandered Biyombo for 16 PRA in the second round, too bad. Congrats on those who got his 26 rebs (and 4 blocks to boot). Of course I had the wrong order for DeRozan and Lowry. I had DDR for 37 when Lowry had a 51, and now I picked Lowry for 29 when DeRozan got a 41. Minus 26 for these two alone. Wanted to pick Cory Joseph but thought I have to pick Lowry. Joseph was quite good, Lowry started with too many fouls (second foul five minutes in the game, third foul after four minutes in the second quarter). I will now try Joseph in g4 thereby dooming his performance. Tonight I stand by my pick Steven Adams. I still think the Warriors will win the series eventually. But, if the Thunder win tonight, it´s about panic mode in g4. Let´s hope it doesn´t come to that. I got a bad feeling about this Warriors Game 3. I am picking Waiters tonight. And hope for a Warriors win. If Thunder advance I will be in a big trouble, only Durant and...Roberson? But I would be anyway with Waiters available, so I will trust Curry&co. Toronto stepped up in a big way to get back in their series with Cleveland and now trail 2-1 with a pivotal Game #4 (for them anyway) coming up on Monday night. Still like Cleveland to at least win all of their home games until something changes, so still liking the Cleveland Cavaliers to move on to the next round eventually. Louis Scola (1 PRA) was horrendous only tallying an assist despite getting the start. He had better games playing very limited minutes coming off the bench. My second choice DeMarre Carroll (15 PRA) would have been the better choice of the two by far. But the story of the night was Bismack Biyombo (34 PRA) who was a rebounding machine and had a great night at home, and was vital in the victory. Naturally I picked the wrong player on the wrong day as usual. I have a gift for this. DeMar DeRozan (41 PRA) also was decent and Kyle Lowry (29 PRA) finally woke up, even despite being in heavy foul trouble in much of the first half. Cory Joseph (22 PRA) also had a decent effort. Tonight is a pivotal game in the OKC vs. Golden State match up, as OKC now needs to defend home court to keep their advantage after taking a game at Golden State. If the Warriors win tonight, they will get home court advantage back. I believe OKC will win at least one of these home games. If they somehow win two, this might indeed be their year finally. In any event, I have used most of OKC's limited talent other than the big two, and I can't really think of anyone else barring injury, that could possibly step up and be played with any reasonably degree of success. So I am forced to pick another Golden State Warriors player. Going with Andre Iguodala tonight, hoping for a 15+ PRA effort from him. Hopefully Andrew Bogut can at least finally sit a game somewhere so I can take advantage of that to play either/or Festus Ezeli or Marreese Speights. Unfortunately until that happens, or another mega blowout, it is tough to confidently play either of those two hidden options. I know I missed a day but one member from the google group seems to have forgotten about this game having not made a pick in over a week! Looks like Taong will be able to get out of last afterall! I think he might be one of the NBA.com expert pickers. Perhaps Ernie. Possibly Shaq. They always vanish around this time of the playoffs! I have no idea what deal is made to show up as geniuses for half the playoffs (appearing to contend but instead pretend) and then surrender and watch their percentile plummet day by day! .....OKC got this... UP !!! Thunder win big, up 2-1 so I need to take Curry or Thompson in Game 4, in fact I'll probably take 1 in each game. Like the Spurs, I expected to save them for the next round but I need PAR/PARBS NOW and with the Thunder winning big, there is a chance they win games 4 and 6 at home to advance. There is also Draymond Green who has become invisible lately so things are even harder!